This Yin Yoga course offers you far more than just Yin Yoga knowledge. You can easily get Yin Yoga on YouTube, but this course gives you insight into lower and upper body yin yoga secrets. Filmed in Live training you also gain knowledge about the importance of connective tissue, what is energy (and how to communicate about energy in simple terms), and the evolution of Yin Yoga from Patanjali's Yoga. - Yin sequences for hips, knees and low back, in flash card fashion with insightful poetry and information to easily share in class or in life. - Gabe's revolutionary book 'How Yin Yoga Healed My Student's Knee' which reveals how a skeptical massage therapist practiced Gabe's sequence and called him a few weeks later elated that she could do poses that were painful to her knee before. - Yin Yoga video and audio classes so you can experience great sequences and then teach from the depth of experience. - Secret poses and insight on Yin Yoga for shoulders, elbows, wrists and the elusive "upper back." - Learn why "opening the upper back" is an incorrect terminology and what is the 7th movement of the scapula. - Discover how varied the body of students is through edited clips from Paul Grilley's videos. - How to weave Yin Yoga into Yang Yoga classes, and much much more. This Yin Yoga course offers you far more than just Yin Yoga knowledge. You can easily get Yin Yoga on YouTube, but this course gives you insight into lower and upper body yin yoga secrets. Filmed in Live training you also gain knowledge about the importance of connective tissue, what is energy (and how to communicate about energy in simple terms), and the evolution of Yin Yoga from Patanjali's Yoga. Included in this training:- Yin sequences for hips, knees and low back, in flash card fashion with insightful poetry and information to easily share in class or in life. 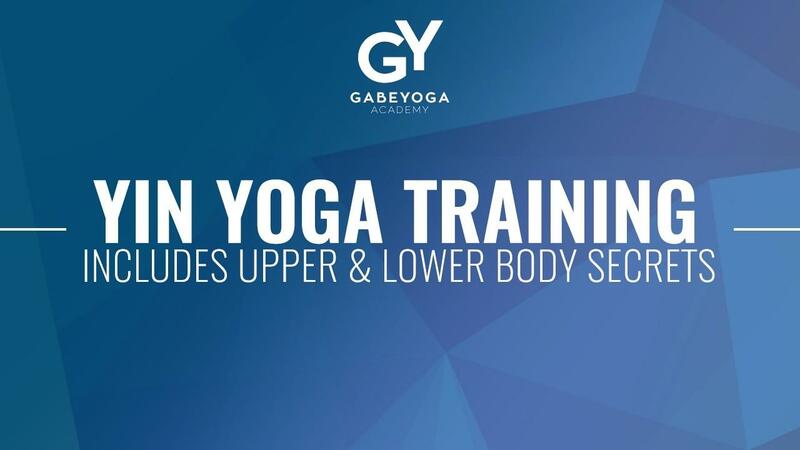 - Gabe's revolutionary book 'How Yin Yoga Healed My Student's Knee' which reveals how a skeptical massage therapist practiced Gabe's sequence and called him a few weeks later elated that she could do poses that were painful to her knee before. - Yin Yoga video and audio classes so you can experience great sequences and then teach from the depth of experience. - Secret poses and insight on Yin Yoga for shoulders, elbows, wrists and the elusive "upper back." - Learn why "opening the upper back" is an incorrect terminology and what is the 7th movement of the scapula. - Discover how varied the body of students is through edited clips from Paul Grilley's videos. - How to weave Yin Yoga into Yang Yoga classes, and much much more.